THIS WEEK’S OTHER FEATURED BOOKS, “SHADY WOMEN,” BY ELIZABETH PRIMAMORE and “AMERICAN SYCAMORE,” By KAREN FIELDING, CAN BE FOUND BY SCROLLING DOWN BELOW THIS POST, OR BY CLICKING THE AUTHOR’S NAME ON OUR AUTHORS PAGE. THE PUBLISHER: Upper Hand Press. SUMMARY: Free Ferry reveals the intrigue and secrecy around the first isolation of plutonium and its impact on an iconic “nuclear” family decades later. Science collides with mythology as the narrator observes her mother, Eurydice, embrace and resist an “underground” existence as postwar suburban housewife. In this 1960s snapshot of classic Americana, idyllic peace flows over undercurrents of annihilation. From outrageous alchemy to Cold War espionage, this book-length poem tracks the lyrical legacies of the first man-made element. THE BACK STORY: I wanted to capture 1960s suburbia, the post-war lifestyle, that I grew up with, and the mythic quality that one’s parents seem to possess—hence the names Eurydice and Orpheus—which strangely fit both my parents. I had also inherited amazing stories from my in-laws about one relative’s role in the Manhattan Project, which in part created the cold war lifestyle we experienced 40 years later. I decided to run this scientific story below the main narrative—just as the reality of nuclear power, its uses and possible abuses, was an undercurrent in post-war America. 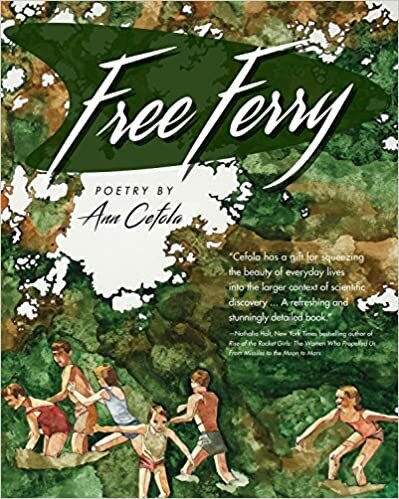 Free Ferry took about 10 years to write, and another five to find a publisher. WHY THIS TITLE? : Free Ferry is the name of the street where my mother grew up, and it seemed like an apt metaphor for becoming accustomed to something—prosperity, electric power or anything else we come to depend upon—without asking about its long-term costs. The unique structure of a traditional poem layout with a bottom narrative give the reader many opportunities to read poems horizontally and vertically. Hot and cold contrasts are explored, dichotomies between the vibrant and the flat, intellectual science transposed next to suburban cold war life. Two stories are being told at once, woven together and they ultimately merge. There is no other poet like Cefola. Her tight, article-free lines zero in on ideas like a microscope and the style of brevity intensifies the action. She sprinkles in italics where ideas almost glow. — Mary Ladd McCray. AUTHOR PROFILE: I am a poet and translator of contemporary French poet Helene Sanguinetti. I live in the New York suburbs where I grew up, and work out of my home as a writer for creative service firms. Free Ferry is my second book, and Face Painting in the Dark my first. Poetry is my first language, it’s what I speak and feel compelled to put to paper. I wanted Free Ferry to be fun as much as it is serious—the poetry titles in brackets can be read as one poem, the main narrative another, and the scientific story still another. How the reader experiences Free Ferry is up to him or her. People who do not normally read poetry have fallen in love with the book, and report reading it multiple times. AUTHOR COMMENTS: I wanted to show that the prosperity of the 1960s, which gave housewives everything at their fingertips, subtly oppressed them, and that they had to suppress their own natural talents in favor of husband and children; and, in the bottom narrative, depict without judgment the excitement of discovery that young scientists pursued at the University of Chicago in 1942, and the eventual world-changing consequences. My hope was that the space between the two narratives would resonate with the unspoken, perhaps the reader’s own thoughts. WHERE TO BUY IT: Amazon.com, Upperhandpress.com. PRICE: Normally $15.00, but on sale for $7 through July 20.